Formaldehyde is the most commercially important aldehyde. Production of urea-, phenol-, and melamine-formaldehyde resins (UF, PF, and MF resins) accounts for nearly 70% of world consumption of formaldehyde in 2017; other large applications include polyacetal resins, pentaerythritol, methylenebis(4-phenyl isocyanate) (MDI), 1,4-butanediol (BDO), and hexamethylenetetramine (HMTA). Most formaldehyde producers are concerned primarily with satisfying captive requirements for derivatives and/or supplying local merchant sales. Formaldehyde is usually produced close to the point of consumption since it is fairly easy to make, but it is costly to transport and can develop problems associated with stability during transport. As a result, world trade in formaldehyde is minimal. Construction/remodeling activity, vehicle and furniture production, and original equipment manufacture (OEM) account for most world consumption of formaldehyde. Demand for these markets is greatly influenced by general economic conditions. As a result, demand for formaldehyde largely follows the patterns of the leading world economies. Formaldehyde resins are used in the wood products industry predominantly as adhesives. Growth of these resins is strongly correlated to construction/remodeling activity (which accounts for over 50% of consumption), and to a lesser degree, the automotive industry. Concerns over possible human carcinogenicity from exposure to formaldehyde have been a controversial issue. Numerous studies assessing the human risk of low-level exposure to formaldehyde have been conducted; interpretation of study findings has been varied. The lack of conclusive evidence has led to widespread disagreement among industry, government agencies, and unions regarding the appropriate risk assessment for formaldehyde. Continuing consumption growth in Asia, mainly China, for most applications will balance moderate growth in North America, Western Europe, Africa, and other countries. China is the single-largest market for formaldehyde, accounting for 47% of world consumption in 2017; other countries with large markets include the United States, Germany, the Netherlands, Spain, Italy, Belgium, Poland, Russia, India, South Korea, Japan, Brazil, and Canada. China is forecast to experience a slower growth rate of 2.6% annually from 2017 to 2022. Demand for 37% formaldehyde in the United States is forecast to grow moderately, mainly driven by UF resins, PF resins, and MDI. Western Europe, Central Europe, the Middle East, the Indian Subcontinent, and South America are also expected to show large volume increases as a result of increased production of wood panels, laminates, MDI, and pentaerythritol, and the start-up of polyacetal resin production in the Middle East. Increasing production of wood-based panels and laminates for both domestic use and exports is largely the driving factor for increased demand, in addition to strong demand for chemical derivatives in markets such as China and other countries in Asia (excluding Japan). Overall economic performance will continue to be the best indicator of future demand for formaldehyde. 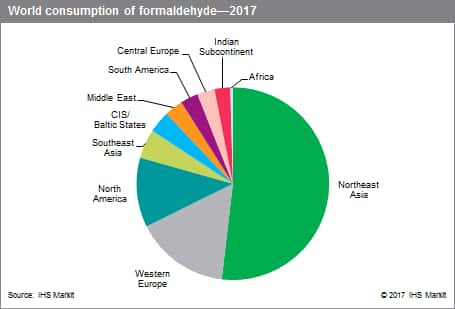 World consumption of 37% formaldehyde is forecast to grow at an average annual rate of about 2.5% from 2017 to 2022, similar to the rate of growth during 2012–17. Northeast Asia, especially China, continues to add capacity for formaldehyde, as the largest producer globally.